We are still waiting for an approval from the U.S. Citizenship and Immigration Services (USCIS). For all those NOT in the adoption world, that is approval from the U.S. government giving us permission to pursue an adoption. This approval (I-800A) is a form that allows our child to be a US citizen as soon as we bring her home. When we get that approval we can send in our dossier!!! I used to chuckle at the families who posted pictures of themselves with their mailing packages that contained the dossier. What is the big deal? It is just a packet of information. Now I can understand the relief, joy, and pride. That packet of papers represents MONTHS of work! We've been working on our dossier since April. It is now the middle of July. It is also significant because after the dossier, the REAL waiting begins. The next step after the dossier is to wait for a referral (aka: the child!) That wait time is estimated (by our agency) to be 6-18 months. It might be sooner, but expect that time-frame. All hopes of bringing her home this year are slowly fading. I see now that it will probably be next year. If I thought waiting was hard before, I have no idea. Before, I have had things to do: people to call, doctor's appointments, letters to gather, financial statements to write out. I will have nothing to do during this phase of waiting. We will pray for her. We will live our lives. We will save money for the next step (which is travel and it cost THE MOST). If this adoption seems as if it is at a standstill, I know that it isn't. God is still working. What struck me as I waited for this government form is the fact that the form is on its way. It isn't sitting on someone's desk (hopefully!) It is in the mail, on its way to us. It is coming. When I think about our daughter, just sitting there in an orphanage, I get very heartsick and begin to worry. 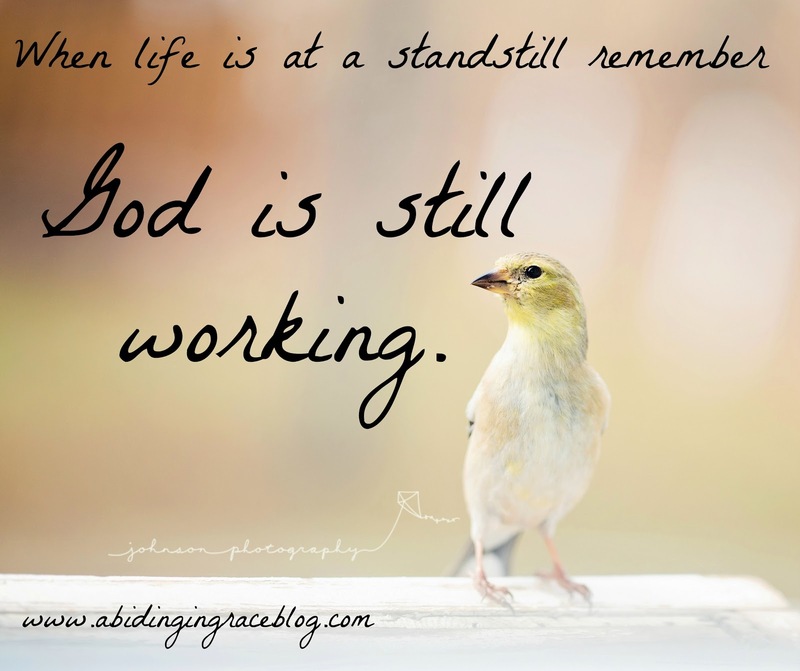 What I need to remember is that God is still working. She is not ready for us. We are not ready for her. Just like that form is on its way - she is on her way! God is not just sitting on His throne, waiting. He is working! He is working in my heart. He is working in the hearts of our family. He is working in my husband's heart. He is working in the hearts of all who will be involved with our daughter's adoption. He is working behind the scenes, orchestrating all the circumstances that will bring her to us. She is not just sitting in an orphanage, she is on her way! She is coming. I want to encourage you as well. Do you feel as if your life is at a standstill? Have you had to put your own dreams on hold because you have small children? Do you have to take the less-than-ideal job to get experience for the job you really want? Do you have to take care of a family member, giving up all your own free time? Are you waiting for a promotion? Are you waiting for your kids to grow up? Are you waiting on test reports? You may not be able to see Him working, but He is! He is working in your heart. He is working in the circumstances. If you are curious about our timeline so far for the adoption, you can click here to find out where we've been and where we need to go.